ChristineCreations: Flourishes Friday Release - Two Beauties! 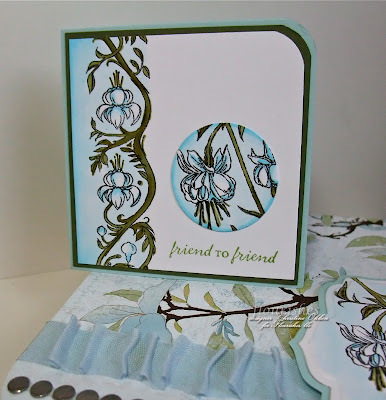 Flourishes Friday Release - Two Beauties! 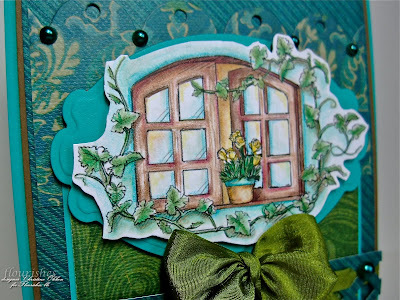 To me this is sort of a Tuscan or Spanish Scene....see the beautiful window opening to the inside warmth and the pretty panes and the sweet pot of yellow roses and vining leaves? YUM. Colored with Prismacolor pencils but the this shot really shows the coloring better. 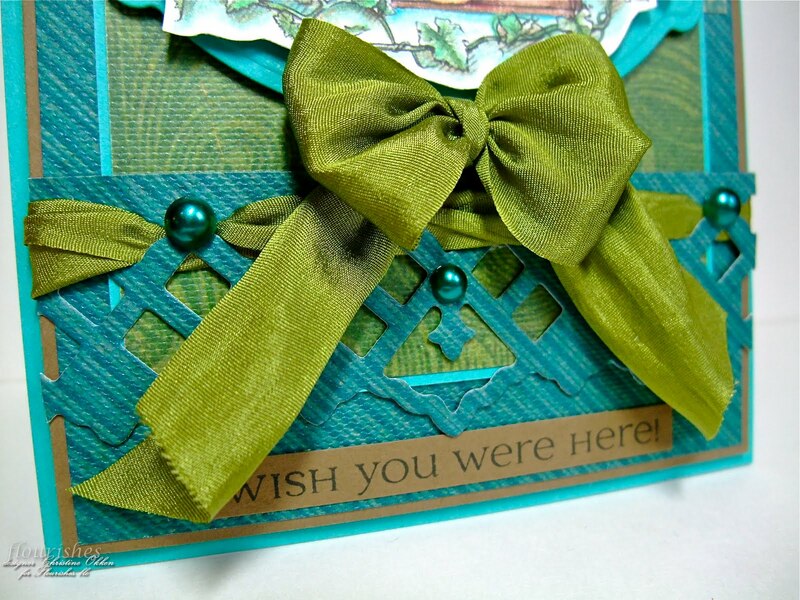 I really love the teals in this card against the greens and yellows and browns. (you can click on the pictures to make them larger to see more details). The papers are an old line of K & Co Christmas dps. I've woven the silk ribbon through the Lattice borderabilities and accented with pearls and a pretty bow made with my Bow Easy. Now how about we travel to Amsterdam? Isn't this little tulip window sweet? I thought it would be perfect as a Dutch window with simple primary blues and reds against the whites. 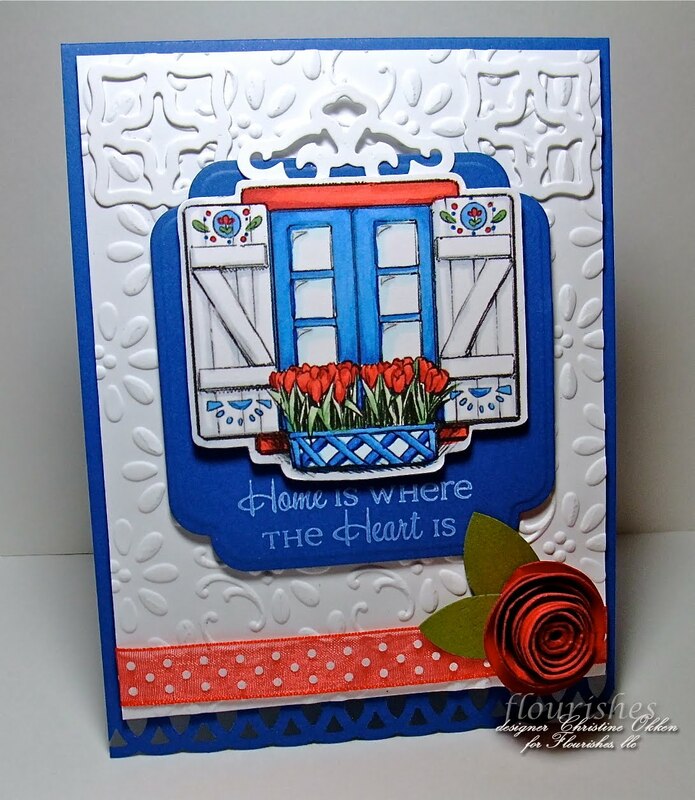 Coloring is done with Copics (Delphinium, Poppy and Fields Collections) and I've added lots of cool gray in the depths of the window shutters to contrast the white, and give it the feeling of shadow. Love the Martha Stewart Ring Punch scallops along the bottom and the rolled paper flower too! Now here is another set that some of you who are FLIP members at Flourishes might recognize. It was part of an earlier offering this summer to Flip Members as a thank you for being part of this great incentive program....and now we get to play with it and you can order it too! Lauren did a great job illustrating this set in such a creative way. 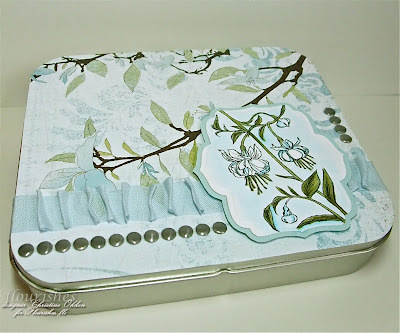 I've just used an old tin that held some stamping product at some point and decorated it inside and out. Here is a detail on the outside. I've used the Sky Collection of Copics for the blues and the Evergreen Collection for the greens. Then to accent the box I've added some gorgeous Cotton Linen Ribbon in blue ruffled on Scor Tape and also these great new Faux Nailheads in grey, seriously aren't they the perfect accent? The designer paper is Memory Box Dewfrost I believe. And here's the inside... 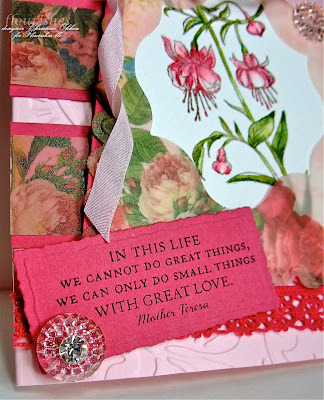 The quote by Mother Theresa reads "In this life we cannot do great things, we can only do small things with great love." I've over-stamped it with the Fuchsias for the box lid. I've lined the box with designer paper and then added little 3 x 3 notecards with home-made envelopes from the designer paper. I love the simplicity of the cards too. 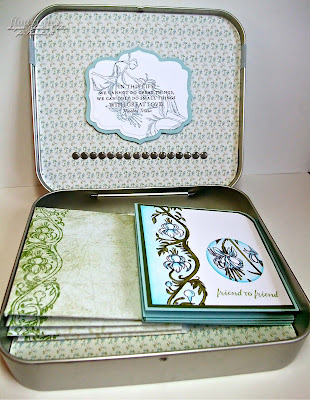 I stamped and colored the border stamp along the edges and colored with copics, and then stamped the main image and punched out part of it with my circle punch adding soft color, rounding one corner on the card to match the tin. I've watercolored this pretty flower stem with reinkers and water-based markers and cut out a window in the beautiful Vellum from Webster's . I think my favourite part about the whole card are these gorgeous new Sparklers I've added as accents! They are just gorgeous and the lightest shade of pink that is perfection for this soft card. I've added both Pink silk ribbon and this pretty Raspberry Crochet Trim. And here is that beautiful quote again done on a nestie. Whew! A Whirlwind tour! And there is a lot more fabulous to see at the Design Team's Blogs (some of whom also have Birthday Blog Candy). These sets are NOW available for order! And to enter to win these sets today see the Flourishes Blog, Winners will be announced tomorrow on the blog for all the fantabulous Birthday Party Prizes from Flourishes! Tuscan Window: Stamps: Windows to the World; Ink: Memento Tuxedo Black; Paper: Taken with Teal, Flourishes Classic White, K & Co Christmas Cheer (? ), Soft Suede; Accessories: Big Shot, Lattice Borderabilities, Fair Isle Petites Borderabilities, Labels 10 Nestabilities, Silk Ribbon, Teal Pearls, Dimensionals, Prismacolor pencils, Odorless Mineral Spirits, Blending Stump, Bow Easy. Dutch Window: Stamps: Windows to the World: Ink: Memento Tuxedo Black, White Craft; Paper: Brilliant Blue, Whisper White Flourishes Classic White; Accessories: Big Shot, Labels 12 Nestabilities, Copic Markers, Dimensionals, Cuttlebug Folder (Finial Press), Sheer Dotted Ribbon, Circle Punch, SU Table Setting die (for rolled flower), Crystal Effects. Stationary Box: Stamps: Fuchsia; Ink: Memento Tuxedo Black, Soft Sky, Memento Bamboo Leaves; Paper: Memory Box - Dew Frost DSP, Soft Sky, Flourishes Classic White, Always Artichoke; Accessories: Corner Rounder, Copic Markers, Faux Nailheads, Cotton Linen Ribbon, Scor Tape, Circle Punch, Envelope Template, Big Shot, Labels 5 Nestabilities, Dimensionals. Fuchsia Card: Stamps: Fuchsia; Ink: Memento Tuxedo Black, Black Stazon; Paper: Flourishes European Watercolor Paper, Webster's Vellum Collection, Pink Pirouette, Rose Red; Accessories: Big Shot, Scalloped Rectangles Nesties, Labels 13 Nesties, Deckled Rectangles, Silk Ribbon, Glue Dots, Crochet Ribbon, Bow Easy, Reinkers, SW Markers, Waterbrush, Sparklers, Dimensionals. Wowzers, Christine, you've been busy!! Love the ribbon treatment on the first card (and the teal paper! 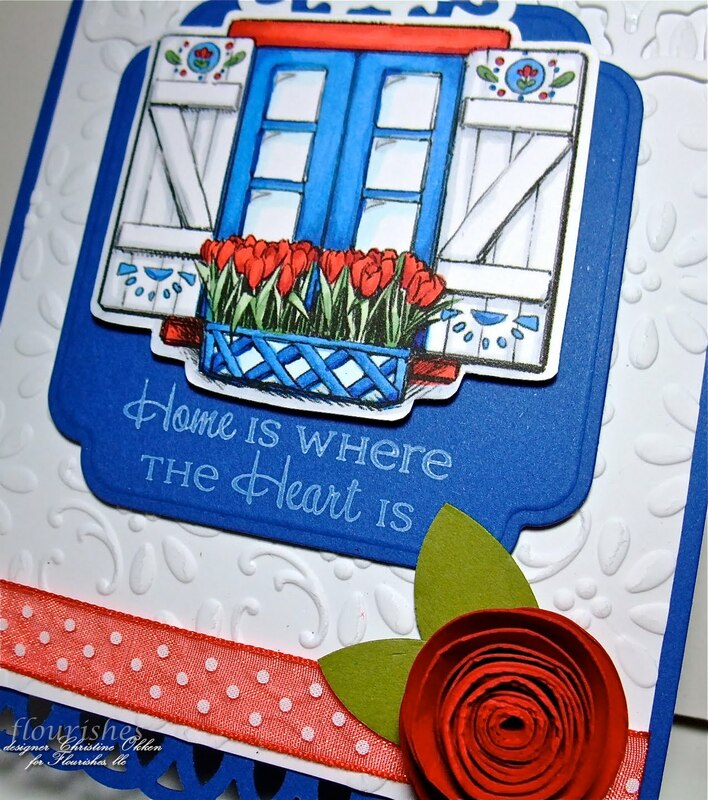 ), the tulips on the second one remind me of the fields and fields of tulips in Holland the year I lived there and all the flower vendors that sold them (LOVE tulips, one of my favorite flowers). wow is right..what fabulous cards, gorgeous designs and awesome coloring. I am just loving these new stamps, I hope I win because if I do not I am going to be broke next month :). They all are beauties Christine!! 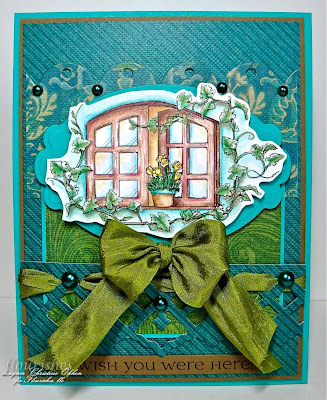 Love the windows with flowers sitting on the sill..Such wonderful beautiful sets they are!! 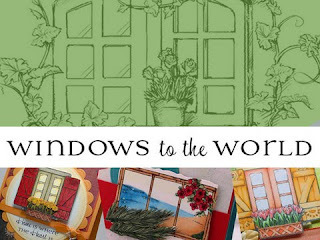 All your projects are lovely, but I am blown away by the first window card. Jaw-dropping gorgeous! Gorgeous cards, Christine...you really know how to do the stamps justice. Wow these are all incredible, love the colors especially on the first card! 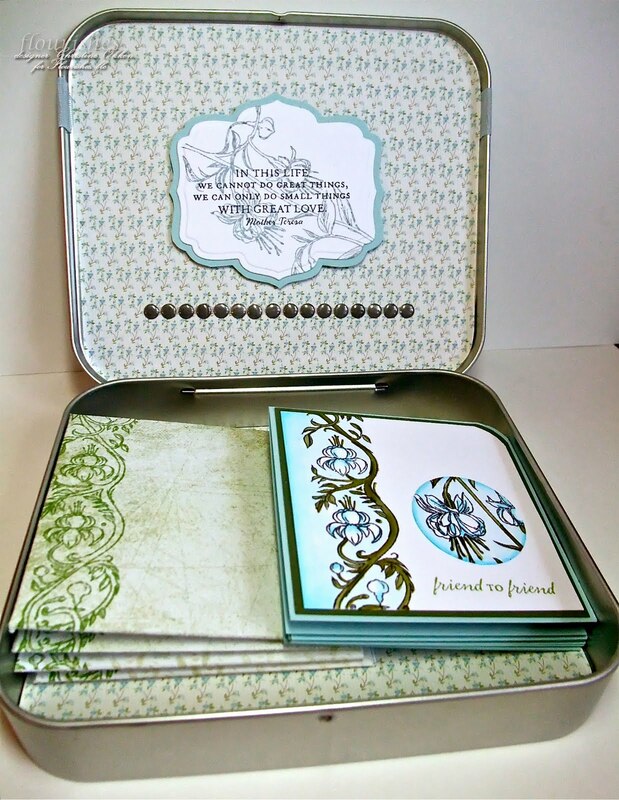 Gorgeous details on your cards...love the card box..what a wonderful gift to give (and receive)....all are beautiful! wonderful creations! My favorite is the little set in the tin. How big are the cards? Did you make the envelopes yourself? oh my gosh!! your projects are absolutely gorgeous! each and everyone of them! love, love, love the fushias! Good golly! You saved the best for last, didn't you? GORGEOUS, just gorgeous cards! The last one with the fuchsia and vellum frame is just stunning. Gorgeous! 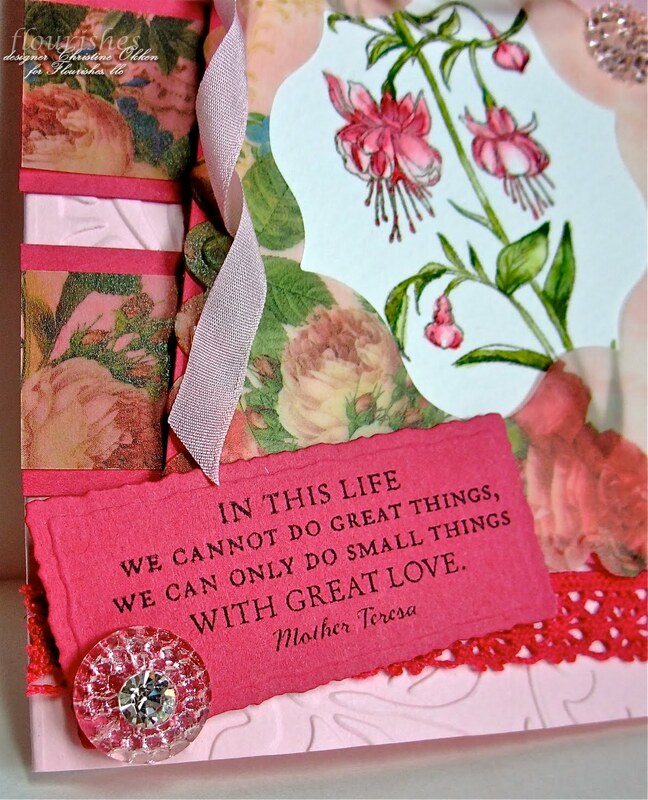 Love the card set you created, great inspiration for christmas giving! So many pretty little details! How long did you spend on each card? Oh my goodness you are busy, everything is beautiful! Love your coloring with the pencils. Goodness, Christine! That's quite a stunning array of creativity! All gorgeous, of course. Your gift set just blows me away. The paper is so pretty with the fuchsias, and I love how softly you colored them. WOW! WOW! Where do I begin?? I love Everything you made!! So creative, Christine! All I can say is, "It's all in the Details"! I am loving everything and enjoying the details you've added to everything. I'm sounding crazy, but I LOVE your Details!! :) Fabulous, Fabulous Creations!! What gorgeous cards! Love that tin! Christine these are fabulous. Okay I LOVE LOVE LOVE the gift set. You know that just speaks to me from everywhere. lol Your windows cards are so detailed and beautiful. Wonderful wonderful work! Fabulous. Fabulous. Love the tin project. another batch of gorgeous cards. 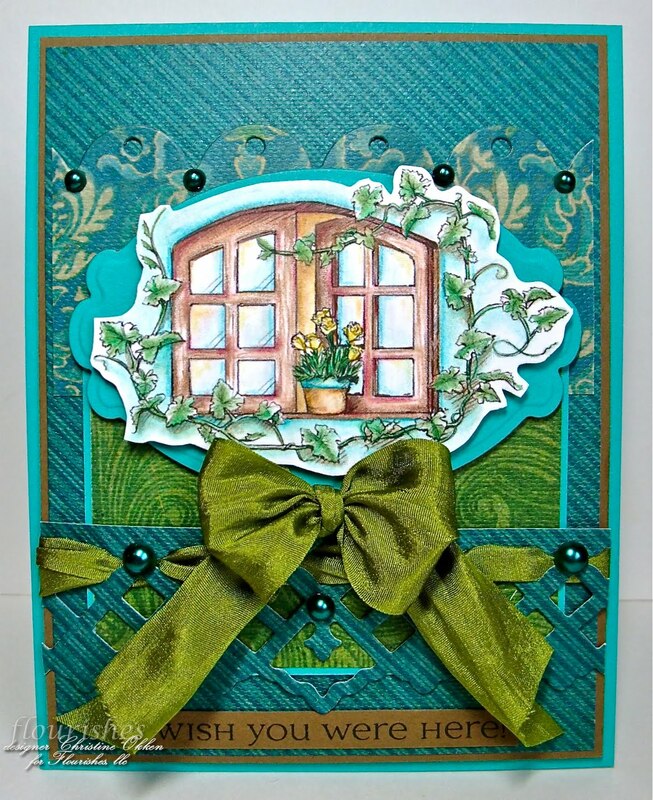 Love the big bow under the window of the first card. Wow Christine-so many wonderful creations! 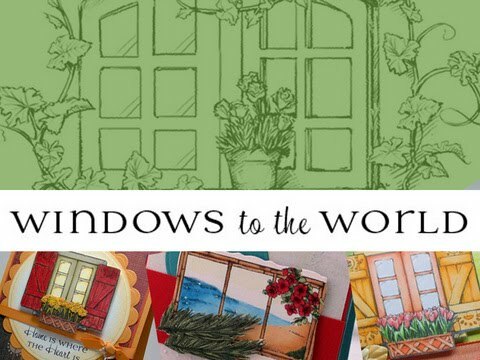 I love the window cards...the themes are spot on! 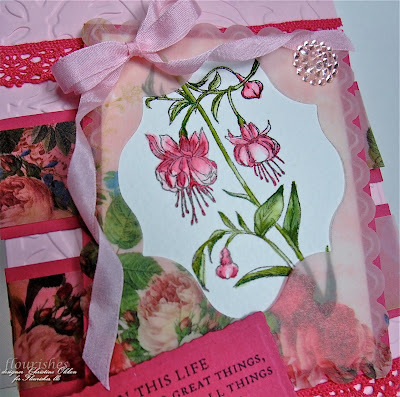 Your fuchsia box is amazing! The card is so pretty too...I love how you used the vellum! Wonderful idea! OK...just stop it right now! These are all just amazing! You have worked these sets to the max! 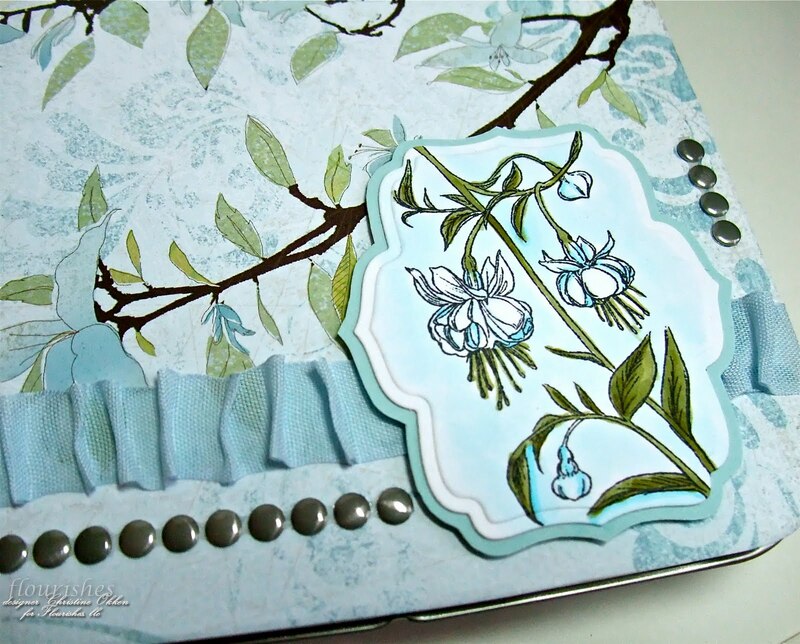 I love the fuscias in blue, and your window cards are gorgeous. Amazing work Christine...you always inspire me with all your little details! What pretty cards. 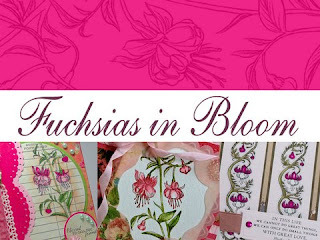 I loved the Fuchsia cards. You have so much talent! You always know how to capture each set in the perfect way.. Your creativity is always top notch.. I love the Holland card.. The blues are just perfect.. 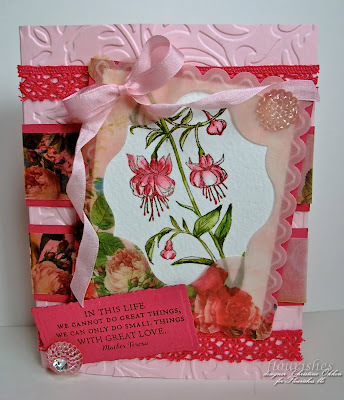 Your Fuchsia set is so pretty in those soft colors... Great job Christine. Love your cards and the new stamps. Would love to win them. Such skill and lovely work flash major wow over this entry. You went all out for this birthday! Well this just all takes my breath away Christine! Wow! I'm thinking I have to have all these Flourishes sets now after seeing these magnificent samples. You are so incredibly talented! Wow, this fuschia is really gorgeous! I love all the different ways you have colored it! Lovely projects! You have been one super busy woman, Christine! Wow! I absolutely love how you showed the different ways that we could use that window image. I love them both. I really love that "rolled" flower on the base of one. Curious how it is made! Love, Love, Love the stationery set you made. Seeing the fuschias in the whites and blues looks completely different. It is jaw dropping gorgeous! Thank you so much for sharing so many versions of the stamped images. They are all amazing! Wow, Christine, these are ALL lovely! Every little detail! Love them all!